Depending what circles you run with, this question may have been nagging you for quite some time. If you’re a member of Stillepost, the message board that plays hosts to almost all of Toronto’s scenesters, you’ve known about DJ Cyber-Rap since 2005. That’s when the 59 year-old widower (born Robert “Ronald” Marie MacDougall) first started posting in the Toronto forum of Stillepost from internet cafes, using painfully effortful internet jargon in an attempt to make new friends. Thought at first to be an “alter”- slang for a fake persona belonging to another, slightly more real but still contrived member of a message board- he was ignored and then banned altogether. Then after re-registering on the board and pleading with the Toronto community for forgiveness, a unexpected twist occurred: DJ Cyber-Rap posted an mp3 of him rapping on his myspace site. And then three more. Using instrumentals by mainstream artists such as Gwen Stefani and Eminem, Cyber-Rap discarded the songs’ existing lyrics in place of his own: his stories about being a widower, raising his teenage son, and living in the Annex were suddenly being expressed through hip-hop. Then on June 11, another twist occurred: “Funeral”, a full-length LP, was released in stores: Soundscapes and Moog Audio both carry copies. What’s more, the CD features less ambiguously real artists- ones who have graced the cover of NOW and eye magazine no less. Laura Barrett, Ninja High School, Pyramid Culture, and DJ Wes Allen all contribute to tracks on the LP. And judging by the press releases on the website for RHEA Music Entertainment Group (Cyber-Rap’s own newly-founded label), it would appear that isn’t the last we’ve heard of the artist. But still, Toronto’s curious to know more about its indie music Keiser Soze. Whoever can take claim for Cyber-Rap- even Mr. Ronald MacDougall- would do well to step forward and receive praise, according to Chart Attack and eye weekly. For now, we have precious insight into the potential ruse… outside of some interesting entries on wikipedia (see: DJ Cyber-Rap, Funeral, Rhea Perlman, and- best of all- Danny Devito). In the meantime we’ll have to pray that unlikely music video and be thankful to Cyber-Rap for throwing a bone to anyone jonesing for some Lost. 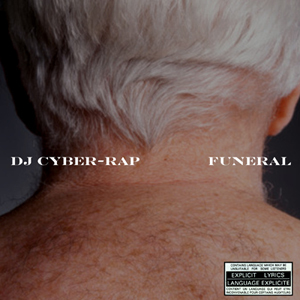 Update: In the three weeks since this article was first posted, more publications have explored the mystery of DJ Cyber-Rap. 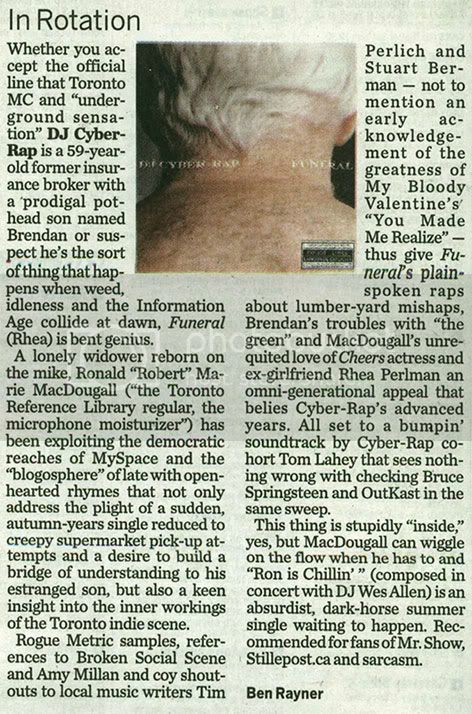 First, Funeral received a review in The Toronto Star. Not long after, Carl Wilson, writer at The Globe and Mail, posted on the subject, first discussing Funeral musically (and suggesting that Tragically Hip frontman Gord Downie is in fact behind the project) before including a Cyber-Rap music video in a subsequent post. The music video, for the song Stylin’ ’06 (Profile of a Mac) has reached over 1000 hits since its appearence online around the time of the Zoilus articles. Within a matter of days, Wilson also featured another song in his Essential Tracks column in The Globe and Mail, alongside tracks from members of Wolf Parade and Björk-collaborators.